England 1st innings 315 (Jonny Bairstow 95, Ian Bell 58, Morne Morkel 4-80) and second innings 2-16 (Vernon Philander 2-4) trail South Africa 1st innings 309 and second innings 351 (Hashim Amla 121, AB de Villiers 43, Steven Finn 4-74) by 330 runs. 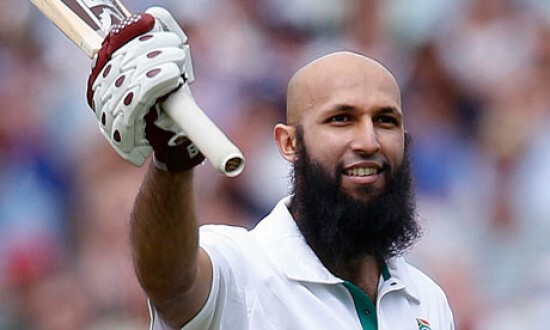 Hashim Amla hammered another majestic ton vs. England as the home side was struggling in the 3rd Test to save the game and their current ICC No.1 ranking. South Africa managed 309 runs in their first innings and consolidated their position in the match by smashing 351 runs in the second. 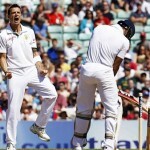 England amassed 315 runs in their first innings and was reeling at 2-16 in their second innings at stumps on day four. The fourth day’s play concluded on August 19, 2012, at Lord’s, London. Earlier, the Proteas started the day at 3-145 in 50 overs, Hashim Amla and Dale Steyn were unbeaten on 57 and 0 respectively. The initial five overs produced just four runs and Steyn posted the first boundary of the day in the 56th over. He was unable to continue and was gone after scoring nine runs as AB de Villiers came in the centre and opened his innings with a four on the first ball he faced. AB de Villiers was dropped on eight on the third ball of the 62nd over by James Anderson at midwicket off Graeme Swann. Amla kept on cruising from the other end with a determination and 200 of innings was attained in the 70th over. 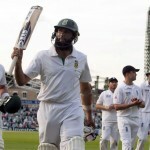 Hashim Amla thrashed his 16th Test ton on the fifth ball of the 78th over with a four behind square. He opened up after reaching his century and dispatched a couple of fours in the 85th over as de Villier secured his end while adding handy runs. The fifth wicket contributed 95 runs when Hashim Amla was finally clean bowled by Steven Finn on 121 runs off 205 balls with 10 fours. The wicket fell at 259 runs and nine runs later Finn struck back again when AB de Villiers was caught smartly by Andrew Strauss in the slip for 43. Jacques Rudolph was unable to impress and went back to the pavilion for just 11 runs when Jean-Paul-Duminy and Vernon Philander gave some resistance. The duo added 54 runs together as the latter was gone for 35 runs and the visitor’s tail vanished quickly. Duminy remained unbeaten for 26 and South Africa was bowled out for 351 runs in 124.2 overs. Steven Finn was the most successful bowler with four wickets whereas James Anderson, Stuart Broad and Graeme Swann shared two wickets each. The Proteas set a difficult target of 346 runs for the English side to win the match. Vernon Philander jolted the home side by getting an early wicket of Alastair Cook in the second over when the batsman was declared leg before wicket for just three runs. Jonathan Trott joined in with the skipper Andrew Strauss and they found it hard to negotiate the deadly bowling of the rival bowlers. Philander made another dent in the batting of the home side when he got rid of Strauss on the fifth ball of the fourth over for mere one run. England was reeling at 2-6 in 3.5 overs when Ian Bell took guards in the centre as Trott kept on surviving at the other end. The two batsmen tried to secure their wickets in the dying moments of the game and added just 10 runs in the next 9.1 overs. England reached 16 for the loss of their openers in 13 overs when the play was called off on the fourth day. Jonathan Trott scored six runs off 39 balls and Ian Bell was at the other end for four scored from 26 balls. 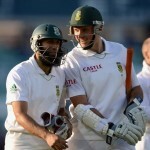 South Africa is at the driving seat after clinching the important wickets of Strauss and Cook. England batsmen have to play masterly knocks to save the match but the visitors have an edge in the match because of their lethal bowling attack and they are just eight wickets away from grabbing the No.1 Test ranking.